Last year Barack Obama’s good friend Rashid Khalidi raised cash for a ship named “The Audacity of Hope” to smash through the Israel’s Gaza Blockade. After months of fundraising his group finally raised enough cash for the mission. The Obama-inspired ship set out to join this year’s Gaza-bound “Freedom Flotilla 2″ with several prominent leftists and Obama supporters on board. 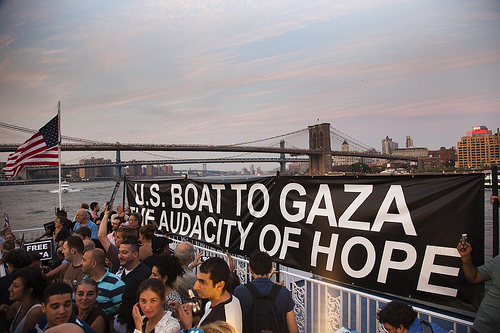 The passengers of the “Audacity of Hope” joined other Islamists and Leftists in the Gaza Flotilla II. But, they never made it out of Greece. Today the Islamo-leftists on the Audacity of Hope threw in the towel. Organizers behind the US ‘Audacity of Hope’ Gaza flotilla ship announced Wednesday they were throwing in the towel and would not be going to Gaza. “The Greek government’s willingness to serve as the enforcer of Israeli’s naval blockade of Gaza made it impossible for this journey to happen,” organizers complained on their website.